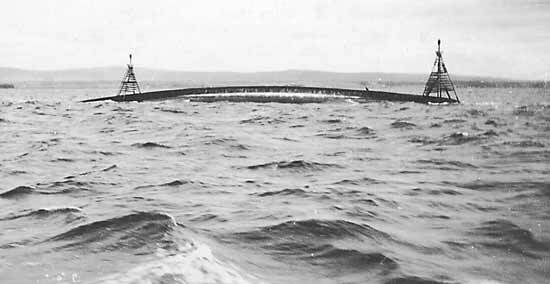 The upturned hull of HMS Natal in Cromarty Firth, 1915. Image in public domain. The French submarine Monge. Image in public domain. The Austro Hungarian destroyers Helgoland and Balaton open fire, then ram and sink the French submarine Monge in the South Adriatic Sea. Allied authorities seize 55 bags of rubber weighing 4,000 lbs from the Swedish vessel Oscar II, consigned to enemy agents. The British Cabinet decides to introduce “a measure of compulsion for military service”. Minister for Munitions David Lloyd George insists on the compulsion of unmarried to enlist. 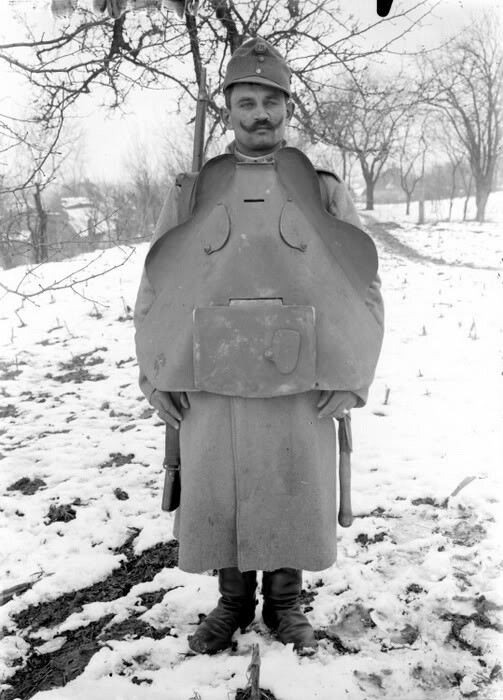 Austrian soldier in body armour, Bukovina Province, 1915. Image courtesy photosofwar.net. 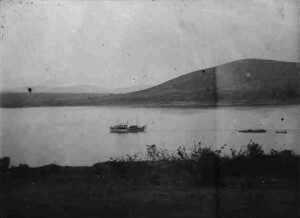 The Kingani on Lake Tanganyika 1915. Image courtesy Kolonialen Bildarchiv, Frankfurt. 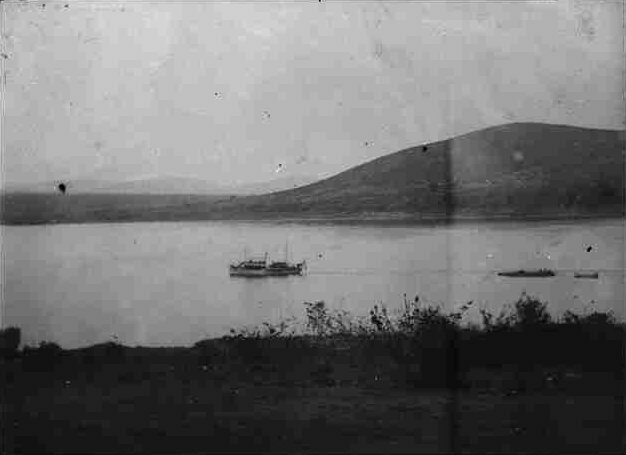 HMS Mimi and HMS Toutou attack the German gunboat Kingani on Lake Tanganyika. 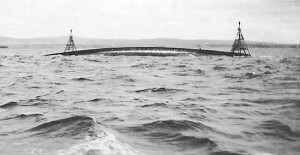 The crippled vessel is captured and towed to the British base, where she is repaired and brought into British service as Fifi – the first German warship to be transferred to the Royal Navy. The German raider SMS Moewe sails from Bremen on her maiden cruise. Disguised as a neutral cargo ship, the Moewe raids commerce vessels, sinking several ships during the course of the war. 1915 Christmas billy, Thomas Sydney Harrison. Image courtesy Australian War Memorial. 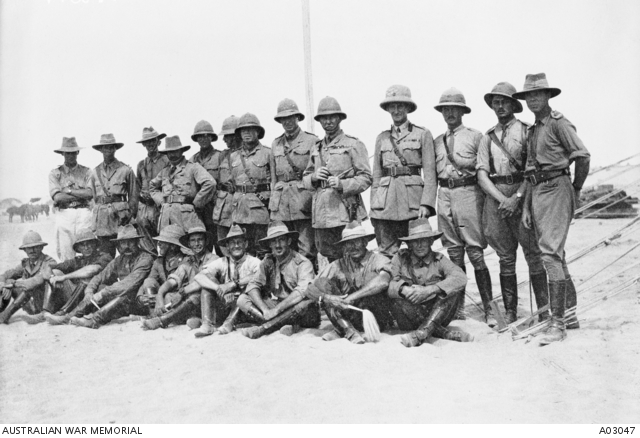 Many Australian troops spend Christmas Day at sea en route from Gallipoli to Egypt; others are camped on the island of Lemnos. 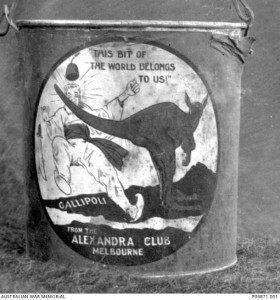 Each man was given a ‘Christmas Billy’, and I can assure you they opened them as eagerly as children at home do open their Christmas stockings … Just one thing hurt very much — it was the picture on the outside of the billy, showing a Kangaroo on the map of Gallipoli, with his tail knocking a Turk into the sea and underneath the words ‘THIS BIT OF THE WORLD BELONGS TO US’. British troops kill 300 Senussi at Wadi Majid. British losses number 13 dead and 51 wounded. James Dalton. Image courtesy Rosemary Serisier. James Dalton was born in Sydney in 1890. His father was Thomas Garrett (“Gatty”) Dalton MA, LLB, and Mayor of Orange in 1903, 1904 and 1905. His grandfather, also called James, built Duntryleague and founded Dalton Brothers Stores. James was the first son and the third of six children born to Gatty and his wife Mary Helene Condon. He spent his childhood at Killiney in Kite Street, a house built in 1875 by his grandfather, and now known as Mena. He was educated at St Ignatius’ College at Riverview. James served in the Senior Cadets for three years and in the 9th Light Horse Regiment, of the Citizen Military Forces for 15 months. When he enlisted in January 1915, James was employed as a clerk in the family business – Dalton Bothers Ltd.
Just two months later, in June 1915, James was promoted to Lieutenant. He served for the duration of the war, in Egypt, Gallipoli and Palestine. In August 1918 Lieutenant Dalton was sent to Jerusalem rest camp, only to be hospitalised three days later, suffering from debility. He rejoined his regiment the following week, but was again hospitalised in December, this time with pneumonia. James died at the 28th Casualty Clearing Station in Salonika on 19 December 1918, less than six weeks after the armistice agreement was signed. James is commemorated on St Joseph’s Church Orange Honour Roll and on the World War I Roll of Honour on the southern face of the Orange Cenotaph. In 1923 the Anzac Memorial Avenue of trees was planted along Bathurst Road to commemorate fallen WWI soldiers. A tree was planted in honour of Lieutenant Dalton; it was donated by his uncle, Michael Francis Dalton. Very few of the trees are still standing today. 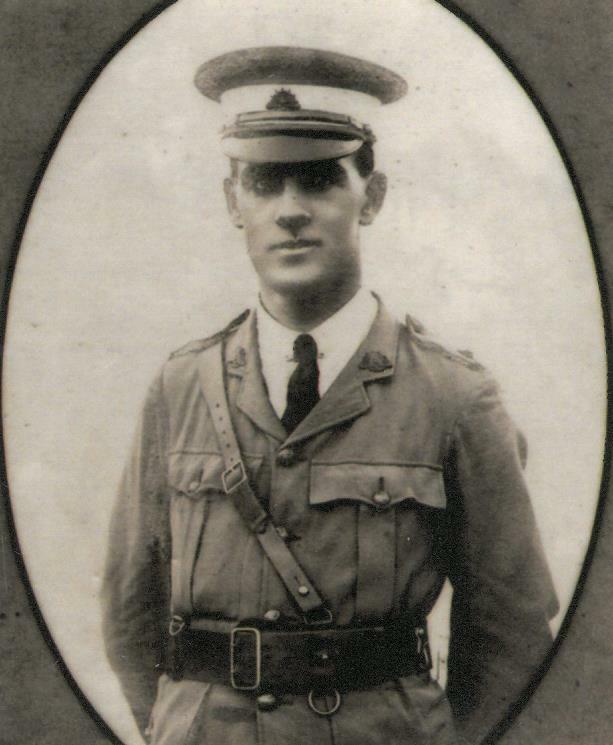 James’ brother Thomas Joseph Dalton also served in WWI; he returned to Australia in 1918. 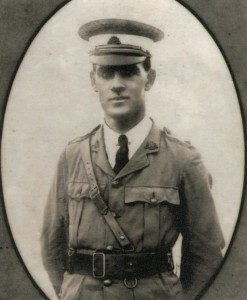 Leader, 30 December 1918, p. 1. 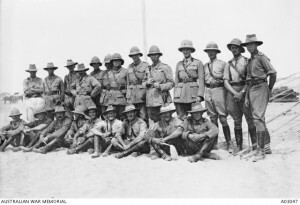 7th Light Horse Regiment officers, Maadi, Egypt. James Dalton is in the back row on the far left. Image courtesy Australian War Memorial. 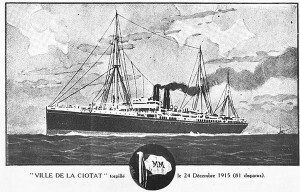 Ville de la Ciotat. Image in public domain. 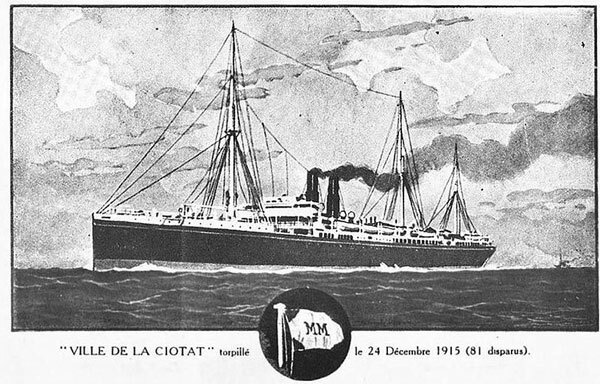 The French liner Ville de la Ciotat is torpedoed by the German submarine U-34 off the coast off Crete in the Mediterranean. Of the 135 passengers and 181 crew, a total of 80 people perish, either killed by the explosion or drowned. The British steamship Meroe rescues the survivors and transports them to Malta. Roland Leighton dies of wounds sustained in battle at the Western Front in France. Roland is the fiance of Vera Brittain, a nurse in the British Red Cross who would later become a famous author and feminist.